This lovely, company worthy dish is adapted from Paula Deen (here). In her recipe, Paula blanches the asparagus. I never blanch or steam asparagus — I far prefer the dense flavor of roasted asparagus. By the time you roast the asparagus with garlic and olive oil, you already have a fabulous vegetable side to serve. Add Paula’s mustard sauce and toasted almonds and you will have food to remember. 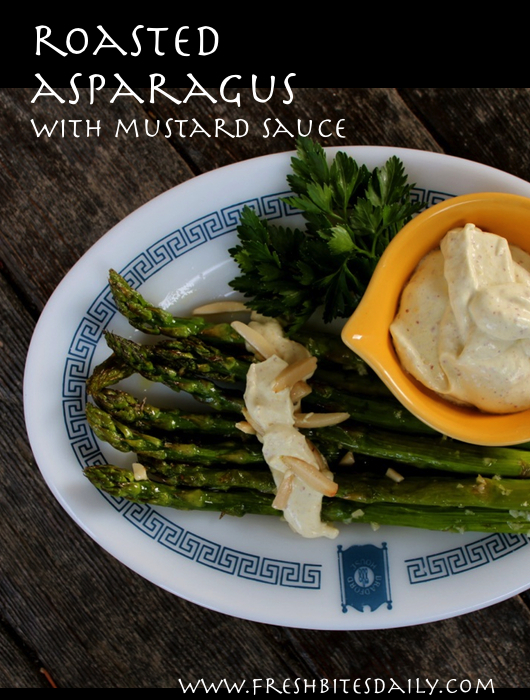 Serve this dish assembled as a side for dinner or consider serving the roasted asparagus spears and the sauce side by side for dipping. Asparagus spears make a great party food because they are just as delicious at room temperature as they are hot out of the oven. Many party guests really appreciate healthy food selections like this and, of course, it’s so easy! Melt the butter in a small heavy skillet over medium low heat. Add the almonds and stir for a couple of minutes until they begin to smell fragrant. Both the butter and the almonds burn easily so do not walk away from the stove to be busy with other things. 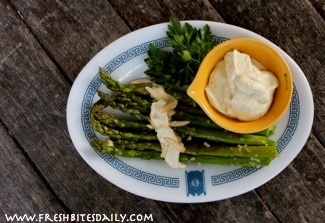 Arrange the hot roasted asparagus spears on warmed salad plates. Drizzle on the creamy mustard sauce and sprinkle with the toasted almonds. Serve extra sauce on the side. Leftover sauce will keep nicely for three or four days in the refrigerator in a tightly sealed container. Enjoy it on other vegetables or your next sandwich.